One-two-three, one-two-three…you know the rest. The King of the Waltz, Johann Strauss II, performed at the Kursalon and the venue continues this tradition with daily performances of his (and Mozart’s) works. When they pulled down the huge city fortifications in the mid-19th century, Vienna suddenly gained a lot of prime real estate. One of the many buildings constructed on the vacant land was the Kursalon, completed in 1867 to a design mirroring the style of the Italian Renaissance. 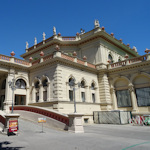 Intended to allow visitors to partake of spa waters, it rapidly morphed into an entertainment venue: Johann Strauss (Jr) himself performed concerts here. The beautifully-restored building now houses a restaurant/coffee house. In sunnier seasons, you can sip your Wiener melange outside and admire the view across the adjacent Stadtpark gardens. The Kursalon has also brought its musical heritage back to life in the form of the “Sounds of Vienna” classical concerts. Pretty much every evening, the salon orchestra, opera singers, and ballet dancers put on a concert featuring the works of Strauss and Mozart, taking you through some of the best waltzes, arias and similar of Vienna’s rich musical tradition. It’s not a concert hall in the pure sense of a Konzerthaus or the Musikverein, with an ever-changing repertoire. Tourists and other visitors tend to dominate the audience. But it’s an easy way to experience classical Viennese music in grand surroundings. Tickets to the Kursalon Strauss and Mozart concerts are available from the venue itself, with smartphone/advance tickets also available here*. There’s a 2-in-1 sightseeing experience to be had here, too: the golden statue of Johann Strauss is just a few steps away and provides one of Vienna’s “iconic” photo opportunities. Everyone wants to be photographed with Johann. Subway: It’s literally next door to the Stadtpark stop on the U4 line. The entrance building to the station is one of many designed by Otto Wagner, a father of modern architecture. Tram: Take the tram line 2 to Weihburggasse: the Kursalon is diagonally opposite the stop, across the park.